Murder had been committed, he was certain, but he was only eight. Even though he was so young, Richard Keene found it impossible to forgive his own helplessness. A little girl’s life had been snuffed out by her merciless father, a killer clever enough to earn sympathy for his bereavement instead of punishment for his brutality, and Richard alone knew the truth. Born with the kind of “supernatural hearing” usually associated with four-footed folk, he’d listened to Herb Dempsey’s ugly way with his daughter, listened as if invisible, to rage dispensed on an almost daily basis. Richard knew the truth about Herb, and it festered and at length diminished his view of himself. Now the adult Richard’s preternaturally sharp ears force an awareness on him he’d just as soon be without, at least at first. 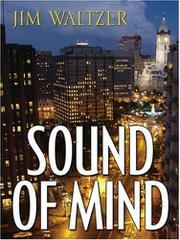 In his Philadelphia high-rise, he accidentally overhears a young woman strangled by her demented lover. Overcoming an initial reluctance to get involved, he turns sleuth and doggedly puts together a case even deeply skeptical cops can’t dismiss. If justice can be done this time, Richard hopes, it will be a first long step toward something equally important: a chance for personal redemption. A sympathetic protagonist and some nice writing are undermined by some first-novel shakiness, especially in plotting. Next time could be much better.